Garlic Dill Quickles: perfectly crunchy refrigerator pickles stay fresh for weeks, are crazy easy to make, and loaded with fresh dill, zesty garlic and spices. In 10 years, this is my first ever pickle recipe and that is pretty shocking. I love homemade pickles! I grew up helping can my families bread & butter pickles. How have I made it this long without sharing a recipe?? Honestly, it’s mostly because I make quickles (refrigerated pickles) more often than anything else. They are just so dang easy and I don’t have to worry about if I am getting my canning technique down right. I have been making these Garlic Dill Quickles for years now and the recipe is perfect in my humble opinion. I love using tons of fresh dill to give them all the flavor and fresh sliced garlic. Slicing the garlic is key, because I feel you get the most flavor out of it that way AND you also wind up with pickled garlic. I’m not going to lie, the little bites of spicy pickled garlic is honestly one of my favorite parts. 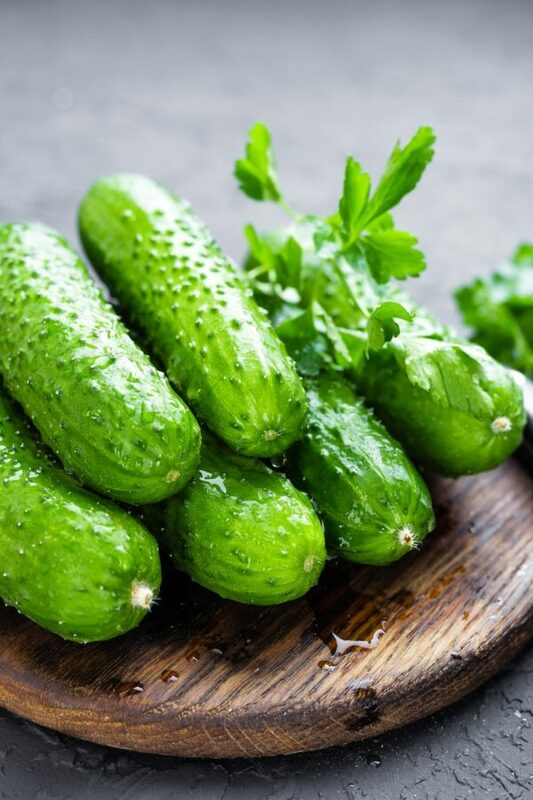 You want to use little pickling cucumbers, but if you can’t find those, you can also use english cucumbers. Both work fine, but I do personally prefer my little pickling cucumbers the best for this use. And lastly, lots of spices and a little hint of sugar! I use lots of mustard seeds, coriander seeds, black peppercorns and salt. These are not sweet pickles, but the sugar does add just a slight hint to them to cut through the vinegar. 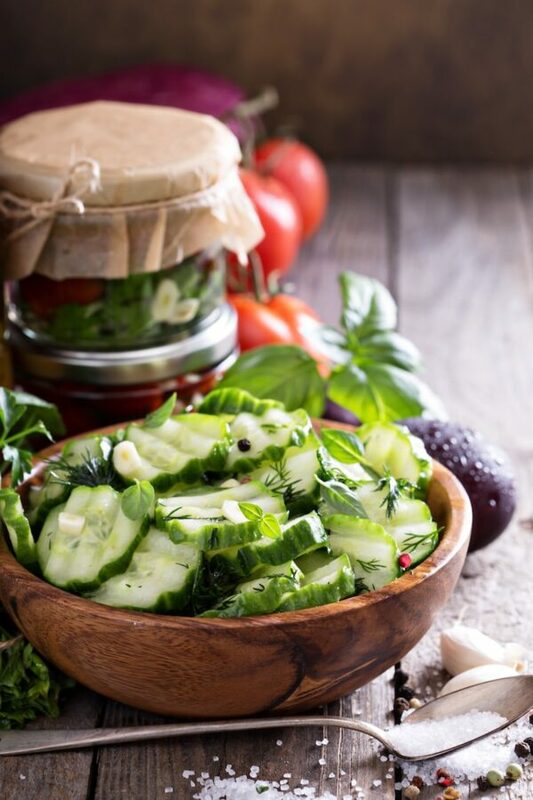 However, you can absolutely skip it completely for some great low carb pickles instead. When I was eating low carb exclusively, I was making tons of batches of these Garlic & Dill Quickles! They make the BEST low carb snack! 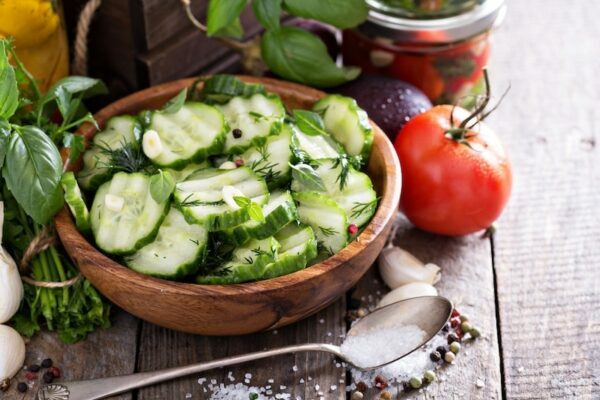 These quickles are super easy to make, especially if you have a mandoline to slice the cucumbers. I have two mandolines, one big one that does crinkle cuts and one small handheld mandoline that is SO easy to use and clean. It’s my favorite, by far. 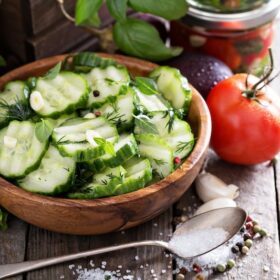 Then you add your sliced cucumbers, spices, garlic and dill to mason jars and bring all the other ingredients together to a boil. Pour all that boiling water/vinegar mixture on top of the cucumbers and seal your jars. Let them cool for a little…and then into the refrigerator they go! You can eat them within hours, or they are best after 12 hours. Then you can store them for up to a month in the fridge! I hope you love these Garlic Dill Quickles as much as we do. They are a staple around here! In the bottom of each mason jar, place a few sprigs of dill. Place half of the sliced garlic, mustard seeds, coriander seeds and peppercorns in the bottoms of each mason jar. 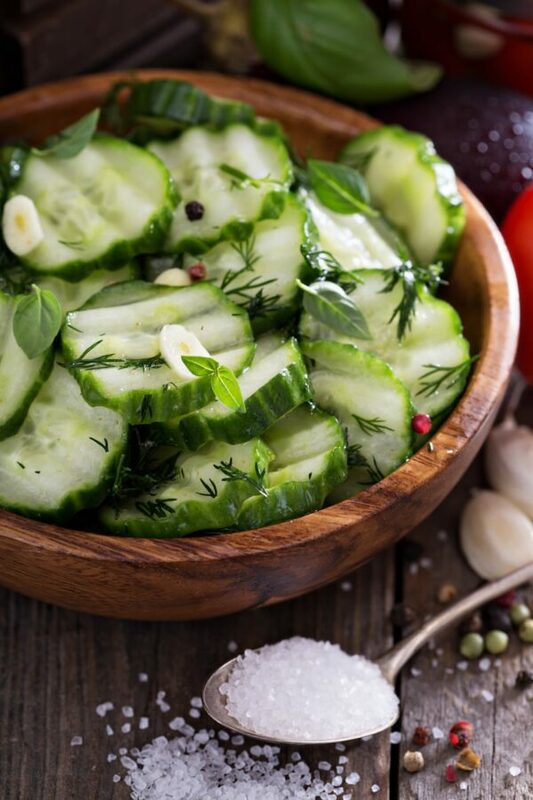 Top with sliced cucumbers. And then top with the remaining dill and spices. Combine water, vinegar, salt and sugar in a large sauce pan. Bring to a boil, stirring often until salt and sugar have dissolved. Carefully fill each jar with the boiling water/vinegar/salt mixture, making sure to get the cucumbers completely covered. Screw on the lids and let cool on counter. Once cooled, transfer to refrigerator and let chill for 12 hours (you can eat them sooner, they will just be crisper and have not taken on all the flavor yet). Oh my this is the perfect combo! I cannot wait to try these! My brother would love these! These would make great hostess gifts all summer long! These look so yummy! Need to try soon! I need to make these stat to have them in my life forever. What a great recipe! I’m too am so in love with the garlic bits. Oh, I gotta have these now! I see a new favorite snack in my near future. Looks great! I cannot pin recipe because all the images on this page are broken though. I’ll check back another time. Thanks! The name is so cute! These look so delicious but I was hoping to make them spicy. Do you have any suggestions? OMG yum!! Love your photos and I’m so glad I found this recipe!